At the section Using the rendering definitions you've already added the static templates. Static templates are a collection of TypoScript files. These files are located in the directory EXT:fluid_styled_content/Configuration/TypoScript/Static/. constants.txt - The file with the default constants. The "Constant Editor", as described above, is using this file for its default settings. Can FLUIDTEMPLATE be used immediately or do we need data processing first? A processor is sometimes used to do some data manipulation before all the data is sent to the Fluid template. 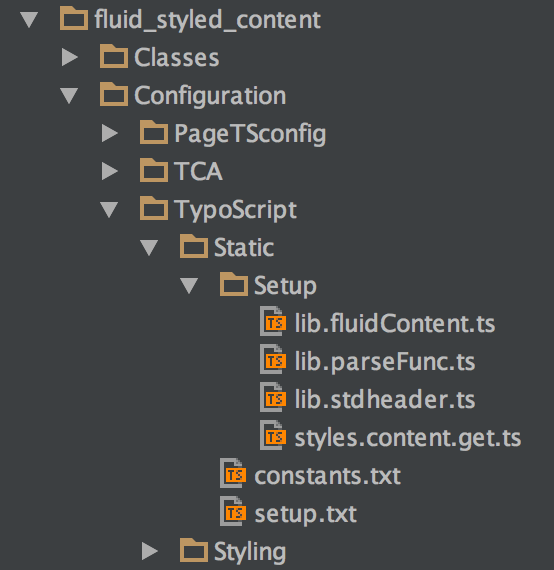 Assigning the Fluid template file for each type of content element separately. The configuration of the edit panel and the edit buttons for frontend editing. You need to activate the extension "Frontend Editing (feedit)" in the Extension Manager to see this in action. lib.stdheader.ts - Copies the "Header only" content element into the lib.stdheader. styles.content.get.ts - Defines styles.content.get as a CONTENT object for colPos = 0.